I admitted I didn’t even weigh 250 pounds when I said I weighed 250 pounds. She congratulated me and thankfully did not accuse me of identify theft. I also made sure to tell her it took me about two and a half years. There is still a humble part of me that feels like I should downplay the weight loss, or at least give a good sense of all the time and work that went into the process. “It doesn’t matter how long it took. You look great!” she said. When I’d first started losing weight, I lived for those kinds of compliments. I needed the pats on the back and the positive words from family and strangers. I needed to know that losing half my weight wasn’t a completely hopeless task, even though it seemed impossible. I’d try to find ways to slip my weight loss into conversations just so I could get compliments on all my hard work. After awhile, I’d lost so much weight that I stopped wanting to tell people about it. While I liked the positive reinforcement the compliments gave me, I also felt strange being the center of attention. I didn’t want to brag and make people feel bad, especially when I realized almost everyone struggles with their weight. As a fat girl I’d known overweight people worried about being fat, but I was surprised to learn that even thin people were anxious about their size and would ask me questions about how they could lose ten pounds. I never knew what to say. These days, I don’t crave those compliments like I did when I’d been on my wobbly first legs of weight loss. I was more insecure back then, unsure if I would make it to a weight that started with the number two, never mind making it to my goal weight of 160. I feel much more comfortable with myself now, confident that I can continue making healthy choices more often than not. And I do it for me, because it makes me feel so much better, not just because I get compliments from random government employees. Though that’s nice too. “Thanks,” I told her and smiled. Compliments are always nice to hear, but I don’t need them to prop me up anymore. No matter what other people have to say, I feel as good as I look, and knowing that is enough. However, I still look like crap in my driver’s license photo, just like the rest of the population. I swear my hair did not look like that in my car’s rearview mirror. Earlier: What would you do for $4,250? That’s so funny. One day, archaeologists will find the remnants of our drivers licenses and will not believe that we were an obese nation- if only we all weighed what it says on our licenses! You may have been 250 pounds (ahem) but you were pretty, and your smile has not changed. You look better without your glasses, yeah. But you think the new photo is bad? I could show you worse… not that I have a photo driving licence, because, well, I have now been a learner driver for more than ten years. But I have some pretty bad photos around. I’m slightly weirded out by the way US driving licences have your weight (or an approximation thereto) on them… I hope that never happens in the UK. Though what with biometric identity cards being dangled over our heads, who knows? I don’t think a municipal employee has ever addressed me as “girl”. That just wouldn’t happen here! I recently watched the movie “200-pound beauty” and there’s a hilarious scene where the once-fat-girl-and-now-skinny-beauty gets into a car accident, but her driver’s licence still shows a 200-pound woman so she is taken in for questioning by the police. I don’t want to ruin it by revealing too much, but it was a really funny movie and I recommend it. At least here in VA they don’t put your weight directly on the license. They do put it in your file though. I had to request a copy of that when I took the bar exam. I discovered that somehow I had told them I weighed 150 lbs… I was more like 200 at the time and had sadly gained even more by the time I was applying for the bar. I was petrified of lying on that application so I put down the correct number. For what it’s worth, I think you should have told the truth on this license. It would have been liberating I think, like saying, yes I weigh this number and I am healthy and I look good. But on the other hand, I guess you have already done that through this blog so who am I to criticize? Your mention of BMV brought me back! I used to live in Lafayette (transplanted from Texas). I got corrected every time I said DMV. I just got a new license also. It is so nice that I actually weigh what I put on my license. Here’s an unsolicited compliment, but I think the picture looks great. The hair thing–nothing I would have noticed if you hadn’t mentioned it! Reading your posts always makes me laugh. You should think about writing comedy after ure done with your book lol. It’s these little changes that you don’t think about that are most meaningful, isn’t it? PQ: Don’t you know that the reason all drivers license pictures are awful is because it’s an incentive. It’s so you’ll think twice about doing anything bad and have to show those awful pictures to the cops! BTW – I think the pic looks great! Wow! That is the best driver’s license photograph I have ever seen. You look great. Of course, you looked great before, too, but I bet you feel better now. You should be proud. Hi PQ, I’ve been lurking awhile and really enjoying your funny and poignant blog. In California the DMV saves money by only making you come in once in a blue moon to renew, with regular 5 year renewals by mail. So my picture and weight info is at least 15 years old…back then I was well on my way to gaining back all the weight I had lost on NutriSystem, so of course I lied and put 150 lbs on my license. I just recently got back down under my lying driver’s license weight. At least the picture kind of looks like me again. Can I have your new license photo? Mine is BAD and it’s going to be with me for six years…. unless it gets “lost”… again. I think it’s just fine you put 150 on your license. Your rationale makes total sense. I can’t wait until I weigh what’s on my license, which is 150 too (but I’m only 5’5”). I weighed 190 at the time it was reissued this past April. I’d have never given my true weight, even if I wasn’t in the middle of losing (only 10 more pounds until I hit my DL weight). texas completely gave up on weight and hair color, but you cannot hide those hairstyles: at small-town DMVs you can still see some great surviving specimens of sweet 80’s hairstyles. i just realized my dl says 180 for weight. it was a total guess at the time because i didn’t set foot on a scale for all of 2005. maybe in 2010 i can lie with greater abandon. I adore you :) And I am so impressed with your cute picture! *sigh* You know I have major DL photo envy!!!! I was shocked to discover than skinny people worry about their weight, too. When I moved to L.A. and met skinny girls who constantly obsessed about calorie counts I thought I’d entered Bizarroworld, but it’s just so pervasive. I think it’s something almost everyone struggles with. Woo hoo for never having to lie again, and being proud of your photo! Its amazing how much your face has changed, I wouldn’t have ever thought it was the same girl. Hey … I just found your blog about a week ago and am halfway through the archives. You are such an inspiration. I know you get that all the time (that’s one thing I HAVE seen by reading your back entries), but it’s true. I’ve been struggling with my weight since late high school, and only recently have I been getting it back into control, but I was in a slump recently. Reading through your entries really helped pull me out, as strange as that sounds. ALSO … I live in New York, and we definitely DO NOT have our weight on our driver’s licenses. This is something that makes me feel ultimately relieved. 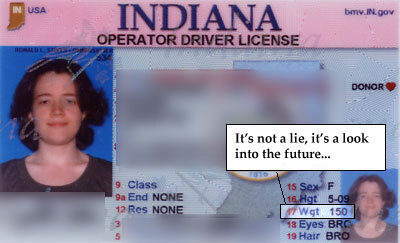 I look into the future every time I get my driver’s license renewed, too! Before I move to another state, I’m going to be sure to check their drivers license policy…if you have to put your weigh, I’m not moving there!! Firstly – you can tell it was you once – the eyes and ‘essence’ of you haven’t changed. Or maybe a fat twin sister or something! Secondly I cannot believe you have to have your weight printed on the DL in the US! AARRGGHH! I wouldn’t drive. Lastly – I know exactly what you mean about being irritated about being the centre of attention. I hate it when I am asked constantly how much I lost that week. Partly because it you didn’t lose the person gets that look in their eye like you’ve fallen off the wagon. Other people are not always good at seeing the big picture and if they say ‘oh don’t worry’ you feel like screaming – I wasn’t! Hee. I never admitted to more than 200 on my license. Which is OK; no one really understands how much women weigh anyway. You could claim 130 and nobody would question it. I notice on my most recent license they don’t ask for weight anymore, they probably figured out what a fantasy that was. They also have a place for “race” but it’s blank. Either that or it’s a white box on a white background! Just have to say that this was a great post. I went and had my license renewed last summer, and I was an all time low of 147. When you compare it to my 220lb previous license… it’s amazing. I kept it. I took photos of it and passed it around to friends online. I brought both licenses everywhere and when people asked about the weight I lost, I busted out the licenses and even they didn’t remember me being that fat. It was great. I will never throw that fat license away. I think it’s nice picture of you on your new license! I can’t wait to get mine next year and look better than 4 years ago. I don’t know why we lie on our weights on the license. I think you should have been proud to say 170 or whatever! I think we just don’t like people to ask us our weights as it is soon personal and then we find ourselves just saying a different number. Or for me, not changing mine much since I was thin years ago. I did up it some a while back but I’m no where near that. ha. My driver’s license has said 165 for some 20 years, and nobody at the DMV has questoined this. I’m glad to know I’m not the only one who lies on that. I once was pulled over by some really smug police officers. They knew I was speeding but they didn’t have the radar on, so they got me for not having a front plate – at the time that was illegal. I remember sitting back there feeling very nervous, my first time being in a police car and they looked smugly at each other and said ‘how much do you weigh’ I was absolutely mortified! I know it was more than the license said and I felt really offended. I must have been a smart mouth as I responded with ‘what do you need to know that for’ and they left it alone. I guess I had that look in my eye that had them realizing they better not push it. What can I say I was fat and desperate. I’ve recently signed up for the Online Jillian Michael’s program – have you heard anything good about it? In South Africa they don’t ask for your weight, but they won’t accept the photograph if it doesn’t look like you. I have a very pretty photograph on my drivers licence and passport. My drivers licence expires in May 2008, so I’d better lose some (um, a lot) weight before then, otherwise I’m going to look like my new ID document, which is hideous! An ID book is for life, but I had to get a new one after my handbag got stolen. I think once I’ve lost weight I’ll conveniently “lose” the current ID book and get a new one with a better picture (I currently look about 50, and I’m only 38). I’ve never lied about weight. I’ve always been slender. But, you say you are overweight at 5’9″ and 150 pounds. That can’t be right. I am the same height and usually weigh-in around 150. According to my doctor I am the ideal weight for my height. I look slender and feel slender. I am on a walking program and when the pedometer reports the calories I have burned, I immediately eat a piece of fudge. I don’t want to lose weight! I am perfect and at 150 pounds so are you. Loved this post! Even when I weighed 224, my driver’s license said 145. And nobody ever questioned it. Wow! You look great! My license picture is just horrible. I dont even know what weight is on there but my face takes up the whole square… fat cheeks and chins right to the edges!! Uh yeah thanks for ZOOMING IN on me, I am so small and all that you HAD to ZOOM IN. But I cannot wait to get a new picture taken!!!!!!!!! Won’t that be the day!! I went in to get my “real” (Im graduated!) license a while back and I realized the fatter I was the more I lied, I mean, I still lied, but not so much. When I was 250 I said I was 160, and when I changed it I was 200 and I said I was 190…. weird……. Pasta Queen, do you still feel the same about not putting your real weight on the liscence, since you didn’t reach the goal weight? I lost 80 pounds several years ago – a lot, at 5’1″ – and was inordinately proud of myself when I put my actual weight on my lisence. Lying on one’s lisence just perpetuates womens’ obession with weight, and shame of overweight. We deserve to have more self respect than this. I’ve lived in four different states, and have always (I think) had my weight on my license. I now live in California, and had to go in a few years ago for the first time in 15 years. My hair color still says “brown”, although there’s more gray. The clerk did not ask me about that or my weight…just tested my eyes (thank you. I want to know that everyone on the road with me can SEE). 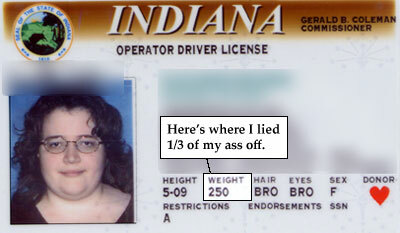 I would love to weigh what my license says (my ideal weight would be about 15 pounds less). However, with all this lying and obvious overlooking of same, it makes me wonder why there is a weight on the license anyway?